So I was looking around trying to figure out why this was happening. I know – the easiest way to find out how to stop it would be to have the fellow employee let me know what site he was at when it was happening. But I digress, here’s how I “fixed” it. You will need to close out of all active IE windows to make the changes stick. You may also need to reboot just to be sure. 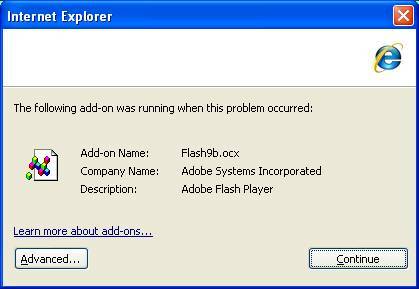 This seems to only affect flash 9b.ocx files when the system also has ATI video drivers.